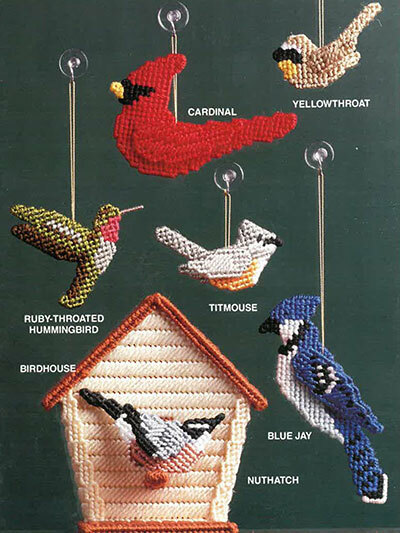 These beautiful birds are made using 7-mesh plastic canvas and Needloft Plastic Canvas yarn. 13 different birds and a birdhouse are included in the pattern. They can be hung in a window, used in floral arrangements, used as ornaments or given as gifts to a friend. I bought this book when it first came out in the 90's. I have really enjoyed it. 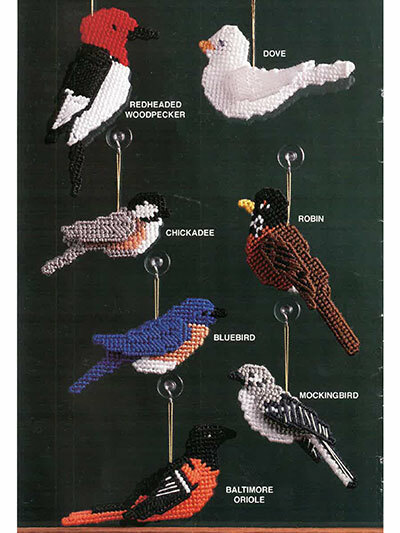 The birds can be made into ornaments or magnets. As ornaments, they can be double-sided, meaning that a reverse side can also be stitched. As magnets, only one side needs to be stitched. I am sure there are many other uses for these birds as decorations. I wish that Annie's would offer Volume II of this series for download; it would be nice to have as a companion to this book. I needed three different birds to complete a project the bird patterns did it for me. Thanks for making them available at the perfect time. These turn out beautiful. Realistic looking.